Hey, guys, guess what? I found my curry paste! Well, that’s not completely true–I’m pretty sure I still have some lurking somewhere, but I have new-found curry paste. From the grocery store. Totally random side note: I discovered that the Walmart down the street from my house does not carry curry paste (or, really, any Asian-ish ingredients beyond soy sauce and chow mein noodles), but they do carry escargots. Good to know for, you know, all my forthcoming escargots-themed posts. Aaaaaanyway. This soup is another one of my recent favorites from Cooking Light (I swear to you all, we’re not in cahoots with them, I just love that magazine–it’s seriously life-changing to have a recipe source that understands that healthy food doesn’t have to be gross). The butternut squash makes the soup creamy and the fact that it’s been roasted gives it depth and dimension. The coconut, lime, cilantro, and Sriracha make it kind of reminiscent of one of my favorite Our Best Bites recipes ever (yeah, I get that the Thai Peanut Noodles don’t have coconut in them, but still…) and it’s super light, healthy, and packed with things that are good for you. I had a hard time getting away with this for dinner with my carnivorous family (read: husband), but it’s perfect for a light supper with a salad or sandwich or you could freeze individual portions for a quick and easy lunch. For starters, you’re going to need 32 ounces of cubed butternut squash (I’m giving you final measurements because I find that’s a lot easier than to sit in the middle of the produce department, staring at the butternut squash(es? ), trying to figure out exactly how much one of those suckers is going to weigh when you peel and seed it. ), olive oil, kosher salt, chopped onion, chicken or vegetable stock, red curry paste, fresh lime juice, and lite coconut milk. 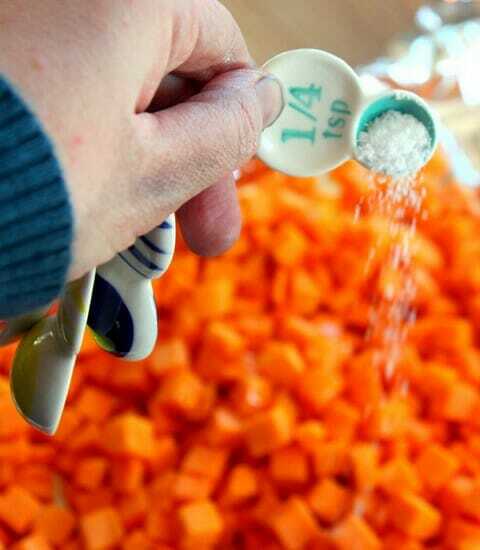 and sprinkle with kosher salt. Ignore the fact that I have nasty winter hands AND that I spent the hour preceding this cleaning black paint off the feet of 23 kindergarten students, thus staining my nails, nail beds, and all the dry little cracks in my hands with black paint. Toss the squash to combine and roast for 35 minutes or until tender and starting to brown. While the squash is roasting heat the remaining teaspoon of oil in a large pot over medium heat. 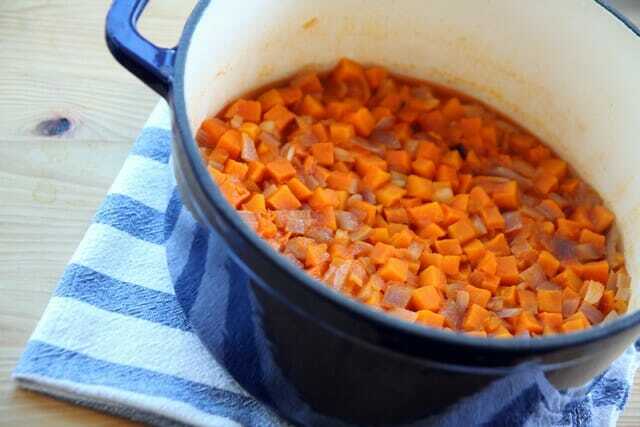 When hot, add the onion and cook, stirring frequently, until tender (about 5 minutes). Add the stock, roasted squash, and curry paste and bring to a boil. Cover and reduce heat. Simmer for 15 minutes. Remove from heat. Add the coconut milk and lime juice. or in batches in a countertop blender. Ladle into bowls and season with a sprinkling of kosher salt, chopped cilantro, shredded coconut, additional lime wedges, and a squirt of Sriracha sauce (if desired). Preheat oven to 450 degrees. Line a rimmed baking sheet with aluminum foil. 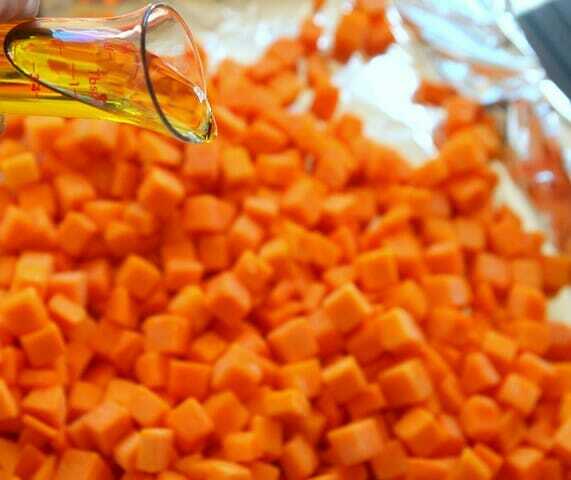 Place the cubed butternut squash onto the lined baking sheet. Drizzle with 1 tablespoon olive oil and sprinkle with kosher salt and toss to combine. Roast for 35 minutes or until tender and starting to brown. Remove from heat. Add the coconut milk and lime juice. Blend until smooth, either by using an immersible stick blender or in batches in a countertop blender. Ladle into bowls and season with a sprinkling of salt, chopped cilantro, shredded coconut, additional lime wedges, and a squirt of Sriracha sauce (if desired). Serve immediately. Girls, I love you especially this month! Thank you for all the healthy, yummy food! BTW, I also loved you when I made 5 different of your Christmas cookie recipes. So you see the fullness of my affection? And, I love butternut squash…and at least one of my sons does too. Thanks for real food as well as fun, special foods. Thai Peanut Noodles are a family favorite here. In fact that’s what we are having tonight with some stir-fry veggies and pork mixed in. This soup sounds great, but I just made another butternut squash soup from your blog a few days ago. And I think my family is getting tired of all the soup we’ve been having lately. 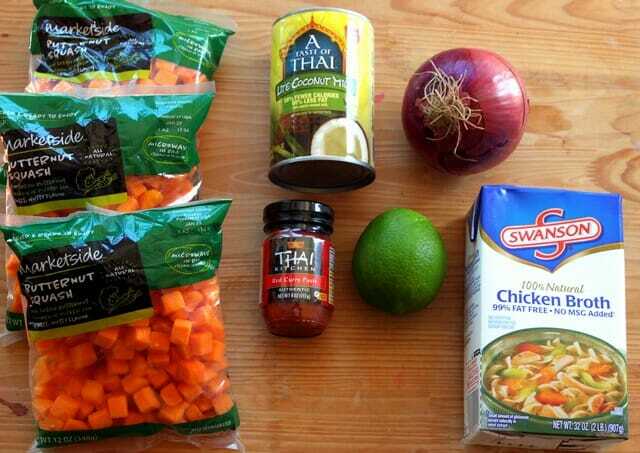 So for now this soup is going on my list to try some day. This looks amazingly good and I can’t wait to try it. About how many cups would 36 oz be? My mom has a gazillion butternut squashes in her basement cold storage, so that’s where I’ll get my squash instead of the grocery store, and knowing how many cups would be helpful. Thanks! I got these bags at Walmart, but I’ve seen packages where the cubes are bigger at Sam’s Club. Oh thank you thank you for posting all these recipes to use up the winter squash in my garage! Why grow them if you don’t eat them, right? About how many cups is 32 oz of squash? And, is curry powder anything like red curry paste? Yellow curry powder is not the same thing as red curry paste at all. They are two completely different ingredients!! Ate an hour ago, just finished reading this post and I HAVE to go to the store to get the squash. I MUST have this soup!!! I LOVE butternut squash soup with curry! I can’t wait to try this one out – love that Thai flavor! I made this soup yesterday, and just had a bowl of it for lunch. The sriracha & cilantro are a must, & I would suggest the curry haters give it a try. Red curry has such a different flavor than yellow curry, which is what I think most people think of when they see curry in a recipe. It is very satisfying for low WW points. Would acorn squash work? 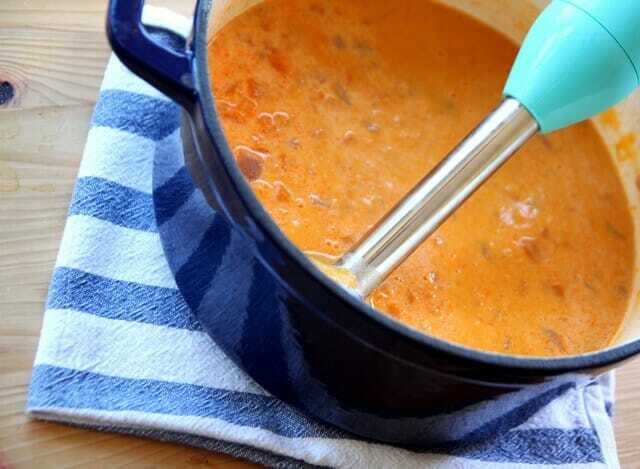 I have three of them sitting in my pantry and this soup looks delish! I can’t even tell you how excited I am about this soup. I heart butternut squash, curry and cooking light. I am also coveting your pot (le creuset? ), just a little bit. OK – I have to ask: Why did the kids have black paint on their collective feet???! I am making this now–it seems like a lot of red curry paste–is that going to be like half the jar? Just wondering. Can’t wait to try it. This sounds great! wonder if I could slide it by the meat-and-potatoes hubby if I made it for lunch? I love fruits and veggies as a healthy snack. I love all the ideas given, I am always looking for something new. What was spicy? Was your curry paste spicy? My soup was super mild until I added a little squirt of sriracha. OMG ours is sooooooo super spicy too! It must be the curry paste we have. 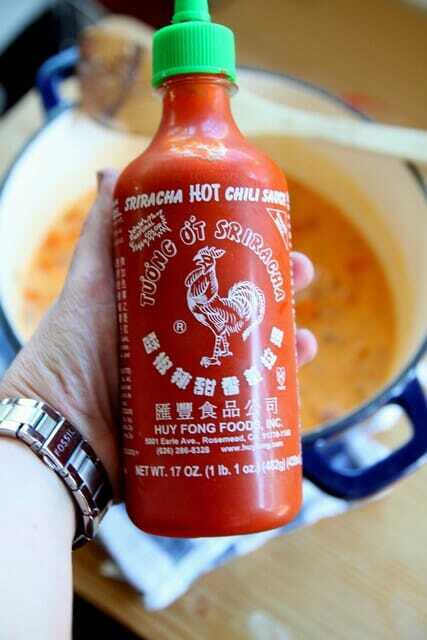 And my husband loves spicy food and has a very high tolerance for it. Haha, I know we’ll eat it anyway. UPDATE: (haha) We tried to lessen the spiciness by adding four potatoes, a quart of milk with flour and bouillon, and it’s still really spicy. We are even serving it with rice. We figure our curry paste increased in spiciness over the year we’ve had it or it’s a super legit brand straight from Thailand…whatever the case, this soup is SPICY. Whatevs, my husband is obsessed all the same. A bowl of fresh raspberries–YUM! Thanks for the giveaway! 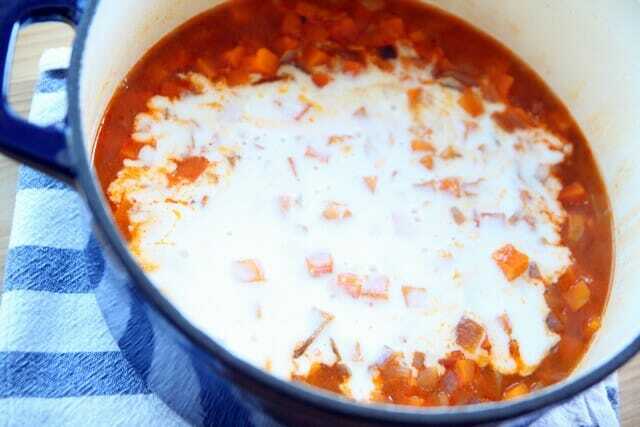 I just made this soup for lunch today, as I miraculously had everything on hand… Loved it! I used Thai kitchen red curry paste and it wasn’t too spicy, but I think I only used a tablespoon and a half, eye-balled it! Thanks for this deliciously low fat recipe as, I am trying to lose the baby weight from just having a baby. This looks delicious, but I am really commenting to say…you should try the hand cream sold by Theraplex. THAT stuff has been life-changing for me and my constantly cracked-open, extremely hypersensitive, allergic-to-lanolin hands. Theraplex sells several creams, but the one I use on my hands is in a white tub. I get it at a local business run by a dermatologist, but I know it’s also available online. Thanks for all the good you do! Made this for dinner. Delicious!!! 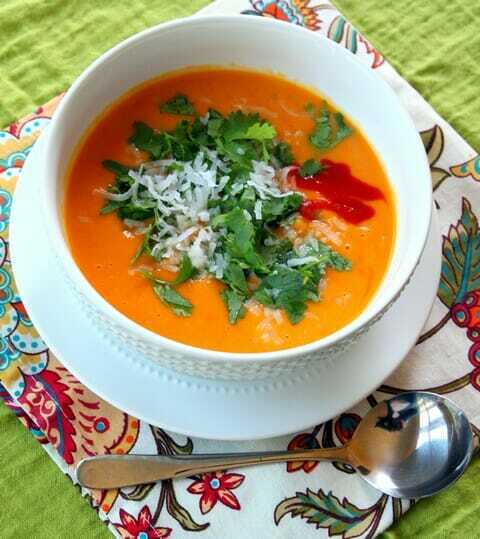 The cilantro and coconut add a nice little crunch to a very smooth and filling soup. The taste can’t be beat. I halved the recipe and it was perfect for two adults. Delicious with rolls or naan dipped in. Could you halve a whole butternut squash and roast the halves and the scoop out the middle and add it to the soup like that? I have a whole butternut squash and am far too lazy to think about peeling and dicing it. This soup is literally the best soup I have ever tasted! I’m not exaggerating. It has all of the flavors that I love. I am in heaven! I loved it with chopped cilantro and unsweetened coconut flakes on top. I made it for my family and everyone loved it. There were 5 of us and we ate all of it (so much for 8 servings!ha!). I served it with the yummy Asian Cabbage Salad from your first cookbook. Amazing!!! Thank you! My curry paste makes the calorie count a whole lot larger.. Oh well! Oh wow this was good. Oh so good. We give it a 10/10! Yum-O! I made this and it is so good! I didn’t have enough squash so I added some cauliflower to my roasting tray to round out the 36 oz. I also used full-fat unsweetened coconut milk because that’s what I had and it turned out divine. Next time I will throw in some shrimp to round out the meal. Yummy yummy! (oh and mine was not spicy at all if you are worried). The taste is really good, but omg 3 tablespoons of red curry paste is really too much!! Maybe the kind of curry I used was stonger, idk, but oh wow my mouth breathes fire!!! I’m making this tonight! Just a note on the curry paste…My experience has been that the Thai Kitchen supermarket brand tends to be quite mild, while the kinds you tend to find at Asian markets are likely to be quite spicy. When I make curry, I use a good half bottle of Thai Kitchen, versus less than a table spoon of the brand from the Asian store. quick follow-up: I made this with only 1 TBS of red curry paste from an Asian store and definitely had plenty of heat!